In his first Rolex Fastnet race Henrik Bergesen and his team on Hydra #149 finished in seventh place in a fleet of nearly thirty Class 40s. 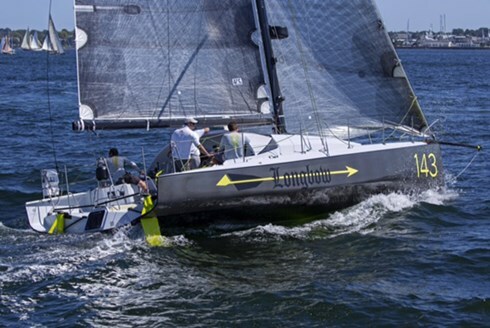 It was a solid performance against experienced 40 sailors in the new Owen Clarke designed fifth generation boat. Hydra held fourth or fifth place until the last 24 hours and finished only an hour behind Sidney Gavignet's Oman Sail; no mean result at this early stage of her career. You Tube coverage here of the leg down from the Fastnet with Hydra topping out at 26 kts. 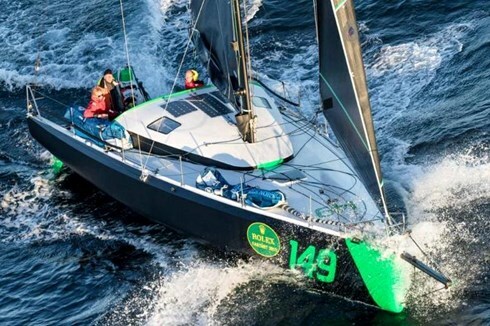 This result follows on from an excellent second place in their first offshore race, the RORC Myth of Malham, where they finished just ahead of Campagne de France, the boat that took second in this edition of the Fastnet. Hydra is making her way to the winter training grounds of Palma de Mallorca and on the way will compete in the Rolex Middle Sea Race. 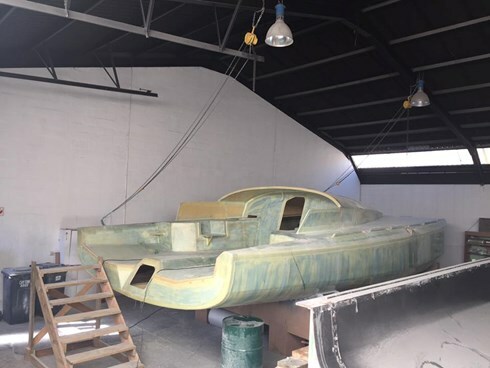 Meanwhile her builders, Cape Racing Yachts are well into the build of boat #2. She's essentially a sister ship of Hydra except as we can see in the picture she's sporting an alternate four winch cockpit layout. The new, as yet to be named yacht is owned by Cape Racing Yacht's proprietor Andrew Thomson who plans to race her in Europe next season. That is, unless in the meantime a purchaser wishes to take delivery in the coming months, in which case he'll commence hull #3. Meanwhile in North America, #143, Longbow continues to be raced outside of the 40 Class by her owner and close family, sailing from their Summer and Winter bases on the Great Lakes and Florida. With next year being a Quebec St Malo hear we have high hopes that along with the European boats, she'll join the North American Class 40 fleet and take part in the 2018 edition of the Atlantic Cup. Longbow was launched at Carbon Ocean Yachts in 2015 and despite a set of production moulds remains the only Class 40 to have been built in recent years on the east coast of the US.